See scan - perfect condition. 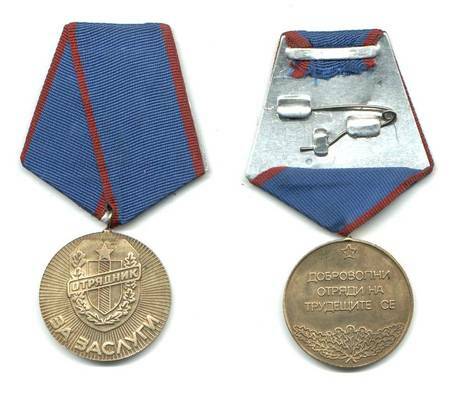 This is an extremely scarce and rare Bulgarian Communist era medal. This medal was awarded to enlisted men for perfect service and merit as part of the State Worker's Police / Militia. These guys were the toughest people in town. They even used force much worse than regular Government Police. Some of the toughest miners and other workers joined this special State Police to keep 'peace' in different districts of all major towns. This was a real political repression kind of a police / militia. Really scarce and rare collector medal.